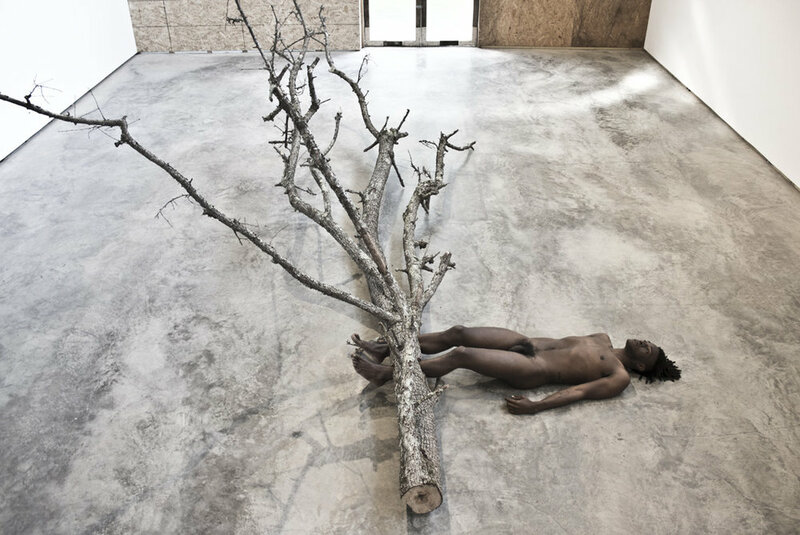 Carlos Martiel is an artist based in New York and Havana whose performance-based work is both physically rigorous and visually poignant. His work has been honored with awards from the Franklin Furnace Fund, the Cisneros Fontanal Art Foundation, and Arte Laguna. Martiel's work draws on the violent history of the Americas and its material and social transformation in the colonial encounter. In these performances, Martiel places his body in situations of duress and pain as a way of conjuring not only traumatic historical events but their legacy in shaping the contemporary reality of life in the Americas. During his residence at Denniston Hill, Martiel worked with staff members to transform the dying pear tree into stocks. On June 25, 2016, Martiel had his legs locked into the stocks for eight hours. "This piece reflects on modern day slavery particularly as it affects immigrants from Latin America working in the United States’ agricultural sector. The undocumented status of an overwhelming number of farm workers has given way to increasing injustice and abuse against them. Reports of exploitation include exclusion from labor laws, pesticide violations, and the use of minors as work force. Out of fear of unemployment or deportation, farmers often remain unable to report employer’s health and safety violations to state authorities. The lack of legal status sets the stage for their invisibility and vulnerability."